So, my 'The Eagle' cookbook, 'Big Flavours and Rough Edges' got another outing last night (Which although out of print right now, is being re-issued soon. Thanks for the info Goodshoeday). I love pasta, especially for mid-week meals, it's cheap, quick and tasty, and there are some fantastic, and unusual pasta recipes in the book; (so I urge you to buy it when it gets re-issued). I decided to try 'Egg Fettuccine with Radicchio, Borlotti Beans and Pancetta' and, true to form it was excellent, I've yet to find a duff recipe yet. To be honest, I was intrigued how it would taste with Radicchio - it's normally considered (In this country at least) to be a salad leaf, whereas apparently in Italy it's used in cooking much more robustly as a vegetable in it's own right. In any case, this all turned out to be academic as I couldn't get any. (Damn you supermarkets!!!) but luckily, the recipe suggested Chicory as a substitute...errrr..which I actually could get- luckily for this blogs readers, otherwise this post would be a bit pointless, anyway; Chicory is another kind of weird salad type ingredient I never know what to do with so I was still reasonably excited. (As much as one can be excited by Chicory anyway). Here's the recipe - it was pretty good, the Girlfriend scored it an 8/10....and after my normal initial screaming fit and childish tantrum at her ungrateful score - I agreed. It was pretty damn good and I'll be cooking this again. 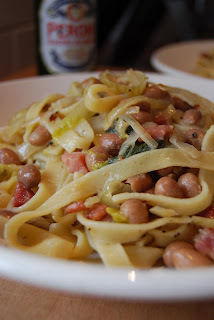 Egg Fettuccine with Radicchio, Borlotti Beans and Pancetta. Small handful of diced smoked Pancetta (Or smoked streaky bacon). 1 head of Radicchio (or Chicory) cored and thinly sliced. 400g Tin Borlotti Beans - drained and rinsed. 400g Egg Fettuccine (Or Tagliatelle). 4 TBS freshly grated Parmesan. Fry the Onion, Sage leaves and Pancetta in the Olive Oil until they begin to brown. Add the Radicchio and cook for a minute or two until it begins to wilt. Add the wine and let it bubble and reduce a little before following with the beans. Keep warm. Cook the Pasta in a large pan of boiling salted water until al dente. Drain very briefly and then mix with the sauce and Parmesan. No doubt your well aware of Halloumi cheese. But, just in case... in the unlikely event you've never heard of it (working on the basis that everything is new to everyone at some point!) Let me quickly explain that it's a Cheese, from Cyprus made from a mixture of Goats and Sheep's milk, and it has two quite unusual properties....You can Fry it, and it won't melt....and it 'squeaks' on your teeth when eaten.....best of all, it tastes fantastic. Here's a recipe for a quick rough and ready dinner or lunch, which uses Halloumi.....my Girlfriend doesn't like Mushrooms much, so for her I bake tomatoes instead , so - feel free to use either, the method is the same. 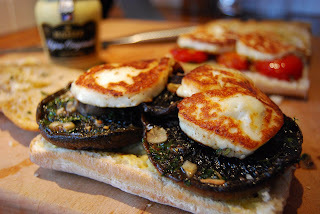 Baked Mushroom/Tomato Sandwich with Garlic, Dijon and Halloumi. Half a Ciabatta per person. A couple of Medium Portobello Mushrooms per person (or 3 Medium Tomatoes per person, halved). 1 Clove garlic finely sliced. Few sprigs of Flat leaf Parsley - chopped. 20g Unsalted Butter - diced. 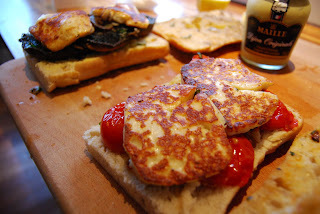 Halloumi - cut into roughly 1cm thick slices - 2 slices per person. Arrange the Mushrooms and/or Tomatoes on a baking tray and cover them with the garlic, flat leaf parley, salt+pepper - dab everything with the butter. Put in the oven for 20 Min's. Cut open your Ciabatta, drizzle one side with the Olive Oil, smear the other side with the Dijon. Heat a frying pan, and cook fry the Halloumi slices on each side until golden - 1-2 Min's per side. Assemble your roll by placing the baked Mushrooms or Tomatoes in your Ciabbata, lay the Halloumi slices on top - and finally a quick squeeze of lemon juice over the top. 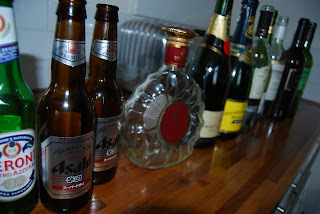 On Saturday night I gave a dinner party for myself and five guests. I generally find cooking three courses for six diners takes me right up to my comfortable stress threshold... beyond that we're into uncharted territory, and it's a good bet it'll involve temper tantrums a five year old would be proud of, and language that would make Gordon Ramsay blush. I was determined that the evening would go without a hitch and without *much* swearing, so I plotted, planned and prepared as best I could in advance, hopefully avoiding the situation where I'd be in the kitchen for long stretches at a time, leaving my guests unattended to get into my drinks cabinet, and generally misbehave. I cooked these last week (and provided the recipe in the comments section here). 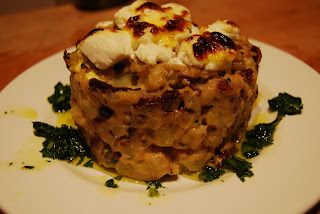 Potatoes, Thyme, Olives and Goats Cheese....honestly, what's not to like? A classic French bistro dish. I've never cooked it before, and chose it because it's a perfect dinner party recipe, tasting better cooked a day in advance to give the flavours time to come out and then re-heated on the night. I decided to serve this with green beans, Mustard and Tarragon Mash and Crusty Bread for mopping up. I've made this a few times before, and it's always a winner - I also made some creme anglaise to serve with it. 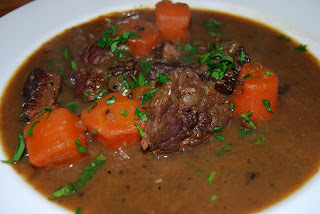 I made the Bouef Bourguignon the night before, and the recipe is easy enough - although skimming off the impurities and oil that collected on the top during the two hour simmer was a pretty labour intensive job. All this needed was re-heating. 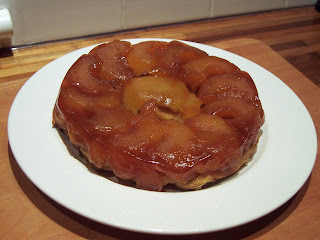 I made the Tarte Tatin in the afternoon, giving it a couple of hours to cool down and be just warm when served. When the doorbell rang, I'd already made the creme anglaise, peeled the potatoes for the mash and started making the Petatou. These Starters take a bit of cooking, and my friends stayed out in the kitchen chatting whilst I scurried around in the background cooking and drinking....a lot. Finally, the starters were brought from the kitchen, my guests were seated (and just finishing their third bottle of plonk), and everyone tucked in. All that really needs to be said is that the plates were cleared entirely...which pleased me no end. I always find it kind of disheartening when someone doesn't like what you've cooked. But, bravely, I try not to show it....the classic 'outside I'm smiling, but inside I'm crying' (and inwardly damning your eyes situation). 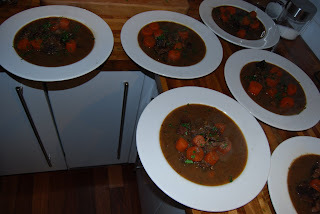 Whilst we were tucking into the starters, I was re-heating the Bouef Bourguignon and boiling my spuds (oooer) for the mustard and Tarragon mash. Timing wise, it was perfect - around fifteen minutes after clearing their plates, I was serving the main course. This tasted better than I thought it would. Obviously, I'd tasted it beforehand, but the overnight stay in the fridge had worked it's magic and it tasted much better. Once again.....cleared plates all around - including the mound of mash. Finally, I served the Tarte Tatin with the Creme Anglaise - three out of three, they ate the lot...even polishing off the remnants of the custard. (I think you'll agree, homemade 'proper custard' tastes amazing, so who can blame them, not me....I'd have eaten it from the jug if it wasn't considered uncouth). So - we retired to the living room for a good middle aged Binge-drinking session, drinking more Wine, Champagne and polishing off my bottle of Remy Martin XO. My friends left at 2am, merry and not a little unsteady on their feet. As for myself, I retired to bed a contented man. Three courses (and accompaniments) for six, all out in good time, all hot, I didn't spend ages in the kitchen, no swearing and tantrums (much) and last but not least - they ate the lot! So, there you have it - my most successful dinner party yet. 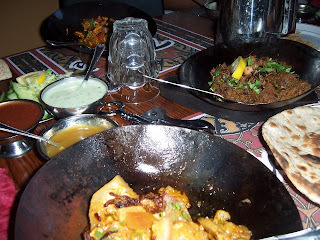 Tayyabs- The best (and cheapest) Indian food in London? 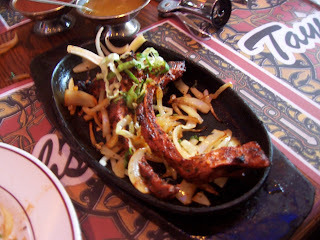 I visited Tayyabs last night with the Girlfriend. I've been there before, but it was quite awhile back and I didn't appreciate it for what it was. I was more than a little drunk (Who me?) and subsequently, I didn't pay attention to what I was eating - all I can remember taking away from the experience was the sense that whatever I ate was good, it was cheap and it was insanely popular, the packed tables and queues snaking around the restaurant and out into the street outside were testament to that. 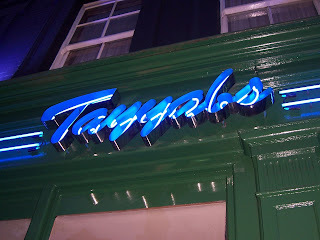 Since then, I've got into blogging and since realised that Tayyabs is revered among Food Bloggers, so much so that when I asked for recommendations on Twitter it seemed like everyone has been there, and everyone has a favourite dish. So, last night, with my list of dish recommendations in my pocket, and dusk fast approaching I strode down Whitechapel High Street with the Girlfriend in tow, pausing only briefly to grab some beers from a handily located off-license. 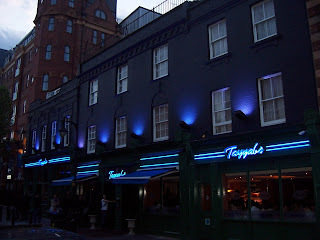 (Tayyabs is Bring your own), and turned into Fieldgate Street where Tayyabs is located. Even at just gone 7pm, the place was packed out with diners. We were shown to our table, a jug of Water and glasses were plonked down, along with a bottle opener and we briefly considered the menu - cross referencing it with my list of recommendations. Tinda Masala (Baby Pumpkin curry). And finally three Roti (It was recommended I order these instead of rice)....I wasn't sure how many to order - so chanced my arm and plumbed for six. The waiter didn't bat an eyelid and corrected this oversight suggesting that I think again, and halfing my order to a more realistic three. The Lamb Chops arrived first, red hot and sizzling, coated with spices. They were gorgeous - although as is always the way with lamb chops, not much meat on them...so they benefited from picking up and eating with your hands, something my Girlfriend refused to do - so, obviously in the interests of review I had to 're-visit' her barely gnawed chops and finish them off. Next came the Roti, I've never ordered these before - plate size flat bread, almost like Naans, but not so 'puffed up'. Then finally out came the curries. I was incredibly impressed with the 'dry meat', it was really tasty and I'll definitely be ordering that again. The Chicken Keema Masala was also a winner, it was pretty spicy though. Last, but not least the Tinda Masala, probably my least favourite dish of the three, but still very nice....every last bit got eaten. Finally, for dessert and despite being stuffed silly - we ordered a Mango Kulfi, which came in the form of an ice-lolly and was gorgeous....really creamy smooth. Now, a word about the service, efficient doesn't begin to describe it - Tayyabs is busy, incredibly busy and the turnaround on tables is a wonder to behold. As soon as my last mouthfull of curry was being eaten, my plate was removed. My Mango Kulfi 'lolly stick' and wrapper, no sooner as I had laid it on the table, an unseen hand materialised from behind and cleared it. The Bill was presented unasked for (Probably the first time I've seen this in any restaurant). And as we got up to leave, our table had already been cleared and prepared and new customers were being ushered into our still warm seats. But, if anything this frenetic energy and buzz just adds to the charm. .....and what it is......errr...is......a gut bustingingly gorgeous authentic Indian meal for two, the like of which I guarantee you haven't eaten down your local curry house for the bargain price of £28. I can't recommend Tayyabs enough - if you haven't been, go. I've recently noted that the first couple of weeks after pay day, I eat very well. Better cuts of meat, more experimentation with new recipes. On the flip side, in the last two weeks I revert back to old favourites, cheaper cuts, and the tried and tested budget recipes. Last week was one of the 'flush' weeks, so a Sirloin Steak Salad featured on the menu, as did some experimentation with a Chicken and Basil dish, and a Portuguese stew, and finally I had my brother and his wife around for dinner Saturday evening, where; against all my dinner party good sense I cooked two completely new and untried dishes. First up the Sirloin Steak. It was from my local butchers, (the better, more expensive one). And was outrageously expensive, but it really was excellent steak, deep red and marbled throughout. 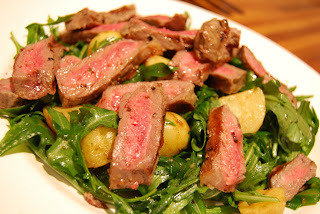 My new Eagle recipe book got another airing, and I used their recipe for 'Tagliata' which is an Italian cut seared steak salad. The recipe combined boiled small waxy potatoes and a heap of rocket dressed with a tarragon, olive oil and balsamic dressing. On top of this, the seared slices of steak are draped artfully! Very nice it was too, I was pretty impressed with this dish - simple, quick and quiet light. But I think I'd shop around for less eye wateringly expensive sirloin next time. 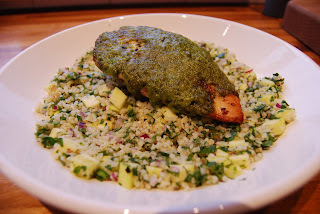 Next we have Chicken Breast with Pesto and Bulgar Wheat Salad. Bit of experimentation going on here, I had leftover Basil so made some Pesto, I cooked the chicken breasts in the oven for 25 Min's at 200c, I then covered the chicken with the pesto and put it back in the oven for 5 Min's. It melted and formed a perfectly even, and pretty attractive 'crust'. I combined this with a bulgar wheat salad (The recipe for which can be found in the comments section of this post). I think this worked pretty well, the chicken coated with Pesto tasted great. My partner reckoned I put too much lime juice in the accompanying salad, at least, that's what I think she was saying whilst I screamed and shouted at her for being ungrateful and having the audacity to criticise my cooking.....just kidding of course, I always ask her opinion on what I've cooked and normally ask for a mark out of 10.....this scoring method normally produces air punches and undignified whooping on my part, but on the thankfully rare occasions my cooking scores low, it generates sullen looks and frosty silences which can make for some interesting evenings! Next up we have 'Potaje de Garbanzos', a Spanish chickpea and chorizo stew. Again, this recipe is from my recently acquired 'The Eagle' cookbook and I really enjoyed it. I think I've cooked something similar before from one of the Jamie Oliver books. No photos of this dish I'm afraid. I forgot and stuffed the lot before I remembered, and in any case it wasn't the most photogenic recipe. But saying that, it was gorgeous - so much so, we'll be cooking this again this week. It combines chickpeas, spinach, chorizo, pancetta garlic and interestingly a chopped, hard boiled egg! Finally we have Saturdays Dinner party menu. As I mentioned previously, I took a risk and cooked two untried dishes, and one I've cooked before. Of the three courses, two paid off, the third went a bit wrong, but I don't think anyone noticed. 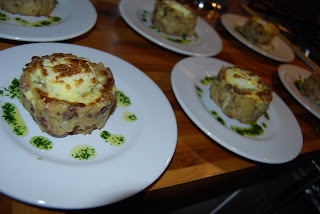 For a starter I cooked 'Petatou' which is a French dish of potatoes, thyme, chopped olives and topped with grilled goats cheese. This was gorgeous, really impressed with this recipe. (From Anthony Bourdains 'Les Halles' cook book). Only negative thing I'd say, the specified portions were massive, I'm hosting another dinner party this weekend and liked this so much, I'll be cooking it again - only this time in much smaller portions. For the main I cooked pan fried cod fillet from the local fishmongers, with Garlic Pomme puree and porcini mushrooms. No photos of this dish I'm afraid. The reason being, I was so stressed out and flustered cooking it, I was worried it would get cold... so served it straight away. 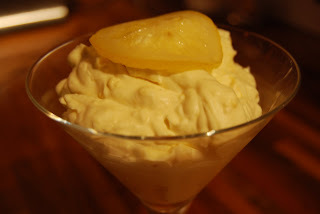 With hindsight, the Garlic Pomme Puree is a simple enough recipe, but for a dinner party would benefit being at least partly made in advance. I left myself too much to do.....and by the time I got around to cooking the Cod (and subsequently realising that I couldn't fit all four pieces in one pan, so had to have two on the go.....and then setting the smoke alarm off for good measure!...I was falling to pieces, well, I think we've all been there.